it seems to have been shown in a similar manner years ago. Explanations in Czechia by Broumov pastor, Dean P. Norbert Josef Zeman O. Cist., and theol. scholar Mr. Premysl Sochor. Dr. Rudolf Maurer, main arhivarius of the town of Baden/Vienna. The copy was found Jan. 18, 1999 by theol. 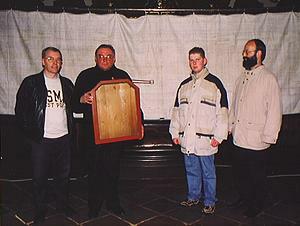 scholar Premysl Sochor in the first balcony to the right in the monasterial church of Broumov, Czechia, hidden in a framed wooden box with a glass door, under the floor of the balcony (in a height of appr. 15m). 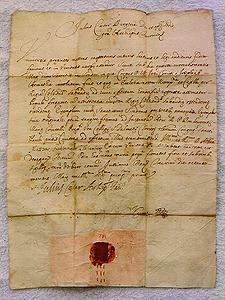 With the linen was the authenticity, i.e., a letter of the archbishop of Turin, Bergiria, giving names, year and date (4 May 1651). 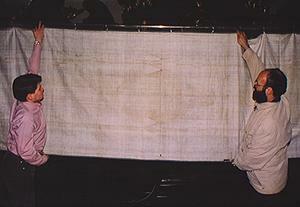 The linen is and is declared to be a handmade copy of the Turin Shroud. The copy was sent by the archbishop of Turin, Julius Caesar Bergiria, to the former abbot of Broumov and later archbishop of Prague, Mattaeus Ferdinand Bilenberg, in a.d. 1651. 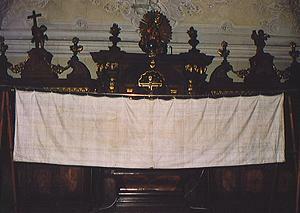 The linen is approximately the same size as the original Shroud and measures 4.71 meters (incl. a border of 12 mm) x 1.2 meters. It appears to have hung up lengthwise. The picture is centered horizontally and vertically on the linen. The head of the copy, clearly showing brush strokes and color particles. Note the Latin inscription "EXTRACTVM AB ORIGINALI" at right. It is not known at this moment when the copy was shown to the public for the last time. Put into negative colours with our equipment, the copy is always flat and brings out no three-dimensional effects whatsoever. Altogether, it clearly shows brush strokes and paint particles. Probably somewhat like this, the people of Edessa made their copy in the year 944 a.d. and giving it to the archdean and referendary Gregorios, hoped he would not notice. But he did notice (everybody would have noticed) and the Shroud came to Constantinopolis. 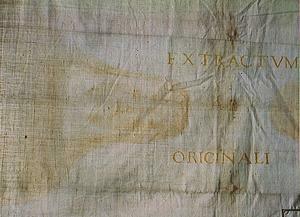 The copy, to me, shows clearly that actually nobody was able to produce the real Shroud by hand, and, by the way, nobody nowadays seems able to do so (either).